Other Products by Musashi. Search other Pre-Workouts products. Musashi Pre-Workout is designed to challenge your training and workouts containing BCAA combinations to take that game or gym session to the next level. BETA ALANINE: This amino acid has been found to help delay fatigue during high intensity exercise. Beta alanine is an important precursor for the production of carnosine, a peptide which is naturally present in muscle tissue. Carnosine acts to buffer the increased lactic acid (hydrogen ions) that are produced during high– intensity (anaerobic) exercise – a contributor to muscle fatigue. Beta- alanine is believed to be a rate- limiting factor in the production of carnosine. Supplementation with beta- alanine may therefore promote an increase in muscle carnosine levels, enhancing this acid- buffering capability and delaying muscle fatigue. ARGININE ALPHA KETOGLUTARATE: Arginine is a conditionally essential amino acid. It serves as an important building-block for the synthesis of nitric oxide. Nitric oxide is a natural gas that we produce. Ones of this gas's main roles is to relax the blood vessels, which increase blood flow to the extremities, and muscle too. Arginine may therefore contribute to more efficient oxygen delivery to exercising muscles. Alpha Ketoglutarate is a key compound in the Krebs or Citric acid cycle and is necessary for the production of ATP or energy. ORNITHINE: An amino acid that performs a key role in the urea cycle. The urea cycle functions to remove the build- up of excess ammonia as a result of muscle glycogen depletion (depletion of energy stores). Production of ammonia is thought to be one of the factors that contributes to fatigue during exercise. BRANCHED CHAIN AMINO ACIDS (BCAAS): These are a subgroup of the 9 essential amino acids. The BCAAs make up approximately 1/3 of the protein found in skeletal muscle and unlike the other amino acids are actually metabolised directly within muscle tissue. The Branched Chain Amino Acids are the preferred amino acids oxidised during endurance training, or high intensity muscle contraction exercises such as weight lifting. Providing BCAAs via the diet may help to limit muscle damage and protein catabolism (the breakdown of muscle), and help to promote the building of lean muscle tissue. CITRULLINE MALATE: Although an amino acid, citrulline is not involved in protein synthesis. Dietary citrulline is taken up by the kidney and metabolised to generate arginine (see above). It is therefore thought to help support dilation of the blood vessels. ACETYL L- CARNITINE: Carnitine is a compound found predominantly within the skeletal and cardiac muscle, it facilitates the transport of fatty acids into the cell's mitochondria for oxidation and energy provision. It also assist with reducing muscle soreness, and may play a role in protein synthesis as we age. The Acetyl L-Carnitine form of carnitine is able to get into the brain, where it may assist as a cognitive enhancer. COFFEE ARABICA SEED EXTRACT: This key ingredient provides 250mg of caffeine per serve. Caffeine is a nervous system stimulant, stimulating heart function, blood circulation and the release of adrenaline (a further stimulatory hormone) from the adrenal gland. Caffeine also enhances psychological processes and neural excitability in the brain. This can increase alertness and reduce the perception of effort which may help to delay the onset of fatigue. Due to these effects, caffeine has been theorised to enhance performance in many types of exercise, including endurance, strength, speed and power. 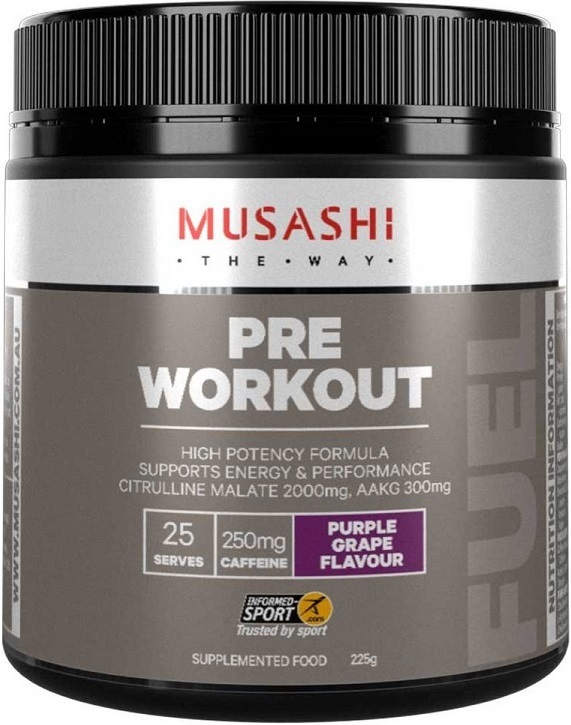 Add 1 level scoop (9g) of Musashi Pre-Workout to 250 - 300ml of water or other beverage. Take 30 minutes prior to exercise.